At today’s iPad-centric Apple event, company’s CEO Tim Cook took the time to share exciting news regarding the App Store. 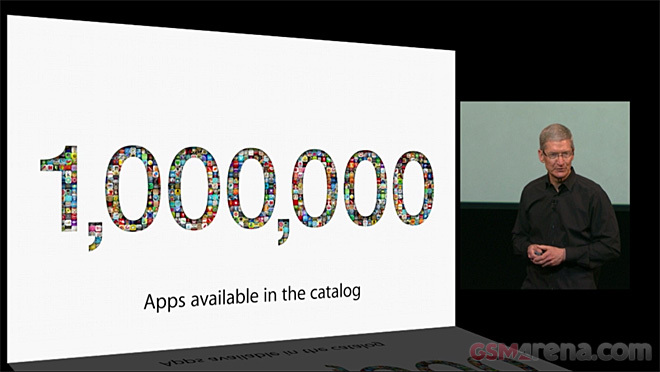 Back in June at the WWDC, the apps in the App Store were more than 900,000 and now they’ve already passed the 1,000,000 mark. Moreover, total number of downloaded apps is now more than 60 billion. The main rival of the App Store – the Google Play Store passed the 1 million apps mark in July, but at that point it only had 50 billion downloads accumulated. Apple has also calculated how much it has paid developers. Apple iOS developers have received north of $13 billion since the inception of the App Store. Tim Cook also shared some insights regarding iTunes Radio. Over 20 million users have given it a go playing over 1 billion songs. Impressive stats considering the service requires a US account, but Apple didn’t disclose any information regarding how much money it actually makes out of its music streaming service.